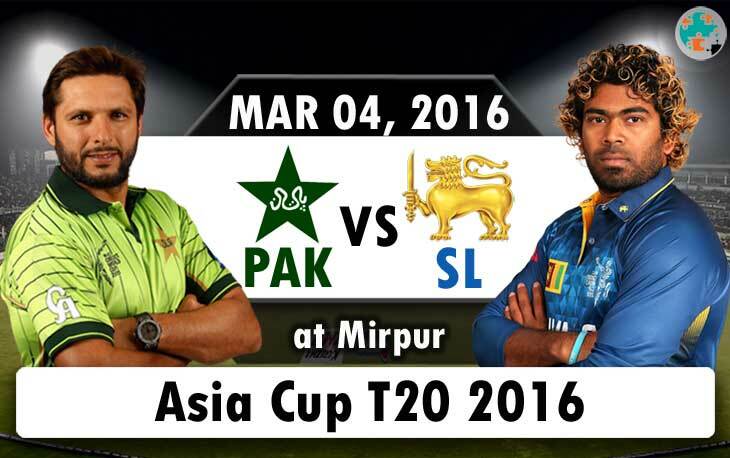 Looking for Live Streaming of Pakistan vs Srilanka? We all known about the finalist of this Asia Cup T20 2016, Yes..! India set to play against with Bangladesh on March 6, 2016. Before that, the last one more league Match-10 is there for Pakistan Vs Srilanka on March 4, 2016, at Mirpur Cricket Stadium. This match will begin on 19:00 IST and you can watch this game on your mobile with Live Streaming here. So far, both of the team played their games as poor in this tournament. The openers of Pakistan didn’t play well in this league matches. Even no one scored above the two digits number, 11 such as Mohammad Hafeez, Sharjeel Khan, and Khurram Manzoor. Vice Versa, in Sri Lanka, the openers are managed their games and scored well as much as they can. Lasith Malinga’s injury majorly affects the team format on last matches. As we are all known about the performance of mid line-ups of Pakistan were, Umar Akmal, Sarfraz Ahmed and Shoaib Malik are played their games well. In Overall Asia Cup T20 2016 tournaments, the bowlers are doing their jobs as good. Unfortunately, some of the teams battings have stayed back such as Pakistan, Sri Lanka and UAE. According to the Match-4: Indian Captain win’s the toss and chose bowl first. So, Pakistan lands their batting line-ups into the ground by order of Mohammad Hafeez, Sharjeel Khan, Khurram Manzoor, Shoaib Malik, Umar Akmal, and Sarfraz Ahmed. Were, Sarfraz Ahmad only scored 25 runs and it is the highest score of Pakistan. But, the team through their balls with the help of evergreen bowler, Mohammed Amir and he took three wickets simultaneously Mohammad Sami also picked two wickets with 4.00 economy rates. Even though, the team falls down in this game. According to the Match-6: This time also, the opponent win’s the toss and bat first. Because of Amir’s ball, the opponents faces are looks as red. In this match, Amir foots his economy rate as 1.50 off 4 Overs. The middle mans are only pushed the total score and chased UAE’s 129. According to the Match-8: Pakistan scored 129 runs by giving Seven wickets with the help of Ahmed’s 58 and Malik’s 41. On bowling, the opponent is chased the Pakistan’s score by faced all the balls from Amir, Irfan and Sami. Because of One win’s off Three, Pakistan lost their Opportunity to play the Final match. According to the Match-2: Dinesh Chandimal scored 50 runs with Seven Fours and Tillakaratne Dilshan scored 27 with Four fours and gave good opening against UAE. On bowling, Lasith Malinga and Nuwan Kulasekara are took 4 and 3 wickets respectively. According to the Match-5: Shehan Jayasuriya is joined on the list of good openers of Sri Lanka, he scored 26 runs with Two sixes. This time, Dushmantha Chameera picked Three wickets against Bangladesh. According to the Match-7: The openers are didn’t scored well but, the 4th batsman, Chamara Kapugedera scored the highest run of this innings as 30 runs and lost their game against with India. So, Sri Lanka pushed back on the points table of Asia Cup 2016. You can also get score updates in the right side of this website. Just refresh every time to get updated score. Star Sports 1, 3 and HD1, HD3. Feel free to comment your thoughts and share with your Cricket circle friends. :). Follow us on Facebook at www.facebook.com/worldhab.